I was in Debenhams cafe recently and asked for a white coffee. The waitress looked at me blankly, “Do you mean a latte?” she enquired. 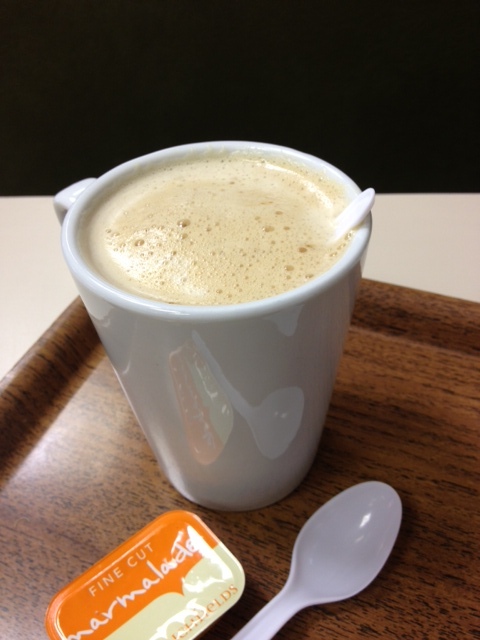 “No” I responded – “just an ordinary coffee with a spot of milk”. Still the blank stare, “You mean an Americano with milk on the side” she ventured. I got my white coffee eventually. It’s not that I don’t move with the times. In Starbucks I employ a whole glossary of terms in my coffee order – tall, soya, wet, decaf, latte, extra hot – but I was a little taken aback that a white coffee held no currency in Debenhams of all places. 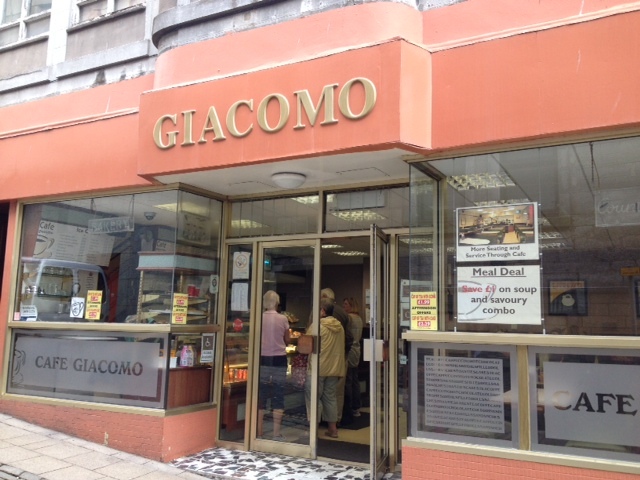 Cafe Giacomo has been in business since the 1950s, and I don’t imagine much has changed since it first opened its doors. This unpretentious Dunfermline based cafe is a haven from modern madness. Most of the seating in Cafe Giacomo takes the form of cosy booths which seem to have been designed for a time when obesity did not exist (a squash and a squeeze for some I would imagine). The waitresses wear green tabards and are invariably welcoming and cheerful. In Cafe Giacomo you will not find a latte, but you can order a milky coffee which is exactly as you would make it at home complete with the gorgeous skin on top as it cools. The clientèle are mainly locals and although there are plenty of young customers there is a leaning towards the old guard who probably came to the cafe with their parents in the 50s. The menu is refreshingly traditional – breakfasts, custard slices and other hip busting fancies, sarnies and baked potatoes, pies, pasties and Knickerbocker Glories. They even sell ice cream cones! There is not a sprig of rocket in sight and although I love a few shavings of parmesan and a slice of prosciutto here and there, it is lovely to have discovered a much simpler world. I make a bee line for Cafe Giacomo every Friday when mini me is bouncing around in her Gymnastics class. My own little tradition is to order a delicious milky coffee and two slices of white hot buttered toast with marmalade and read my book. 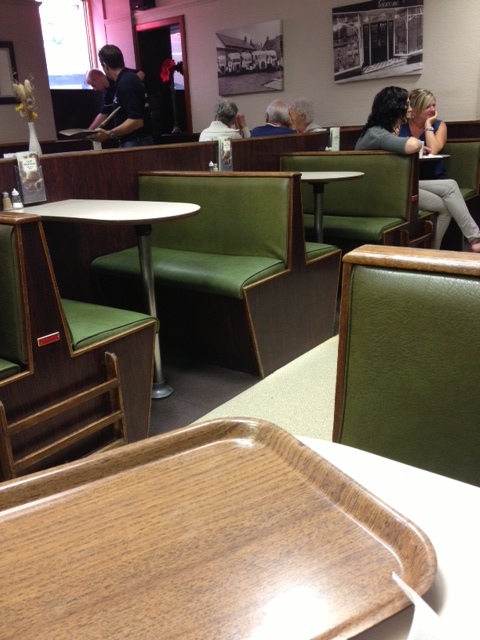 The prices are great, the service is prompt and friendly and the food is good. There is nothing not to love about this charming haunt! Cafe Giacomo is a welcome step back in time to a life before lattes and I for one hope that it continues to do business, unchanged, for the next 60 years. Categories: Uncategorized | Tags: baked potatoes, gorgeous skin, ice cream cones, milky coffee, move with the times, white coffee | Permalink. 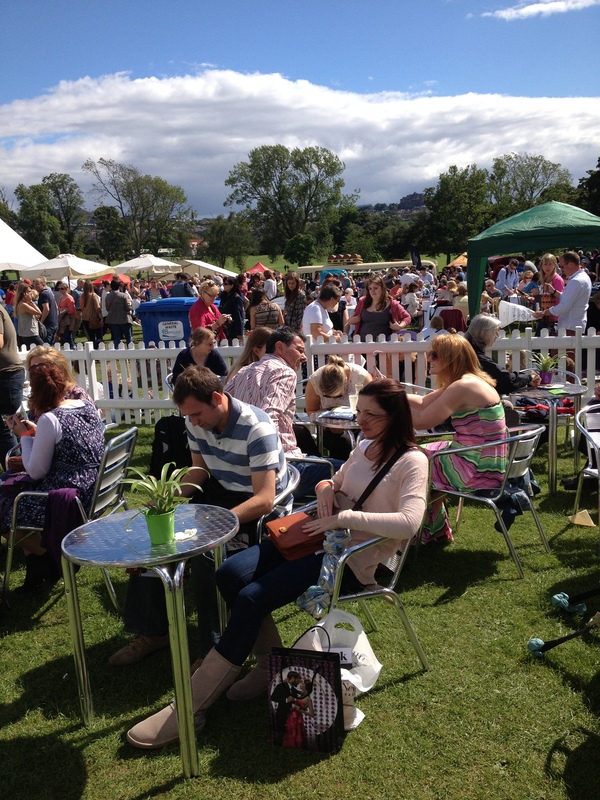 The annual Foodies Festival rocked up to Edinburgh a couple of weeks ago and we were lucky enough to get our hands on some VIP tickets, adding a sprinkle of fairy dust to what is always a great day out. Thankfully it was a lovely dry day as we made our way to the VIP tent in the hope of free fizz. A young laconic chap with sunglasses glued onto his face and a Etonesque drawl informed us that champagne was indeed included as was a meal at one of three restaurants plus access to the many masterclasses throughout the day. We signed up for Bordeaux Tasting for the adults and a Pizza Masterclass for the kids. 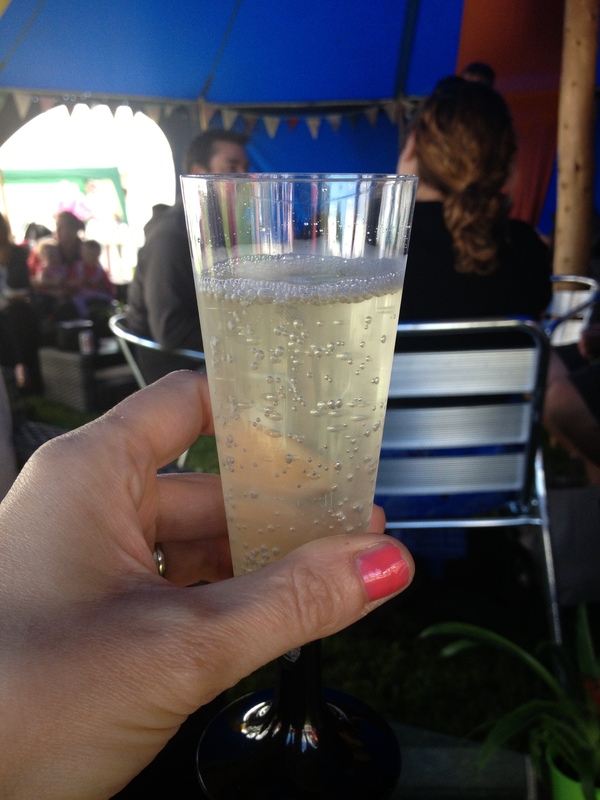 It was a real treat to chill out and watch the hubbub of the festival whilst sitting on a comfy chair, sipping fizz and debating where to eat. Whilst tempted by the amazing aroma coming from Galvin Brassiere we were concerned that the portions would not meet our requirements (we are piggies) so we opted for SOBA for some Thai food. 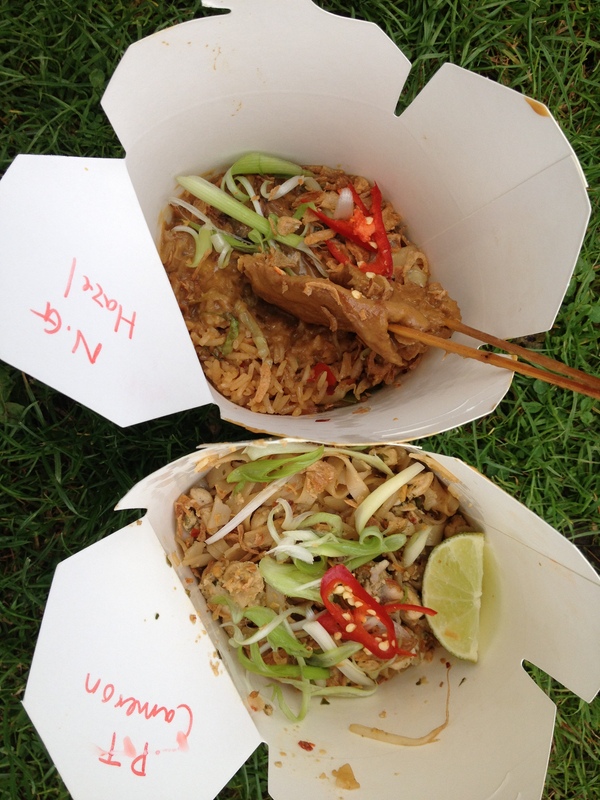 Pad Thai with chicken and prawn for me and Nasi Goreng for B. We also picked up some Thai curry and nibbles to try to tempt mini me who was on week 8 of a general hunger strike. 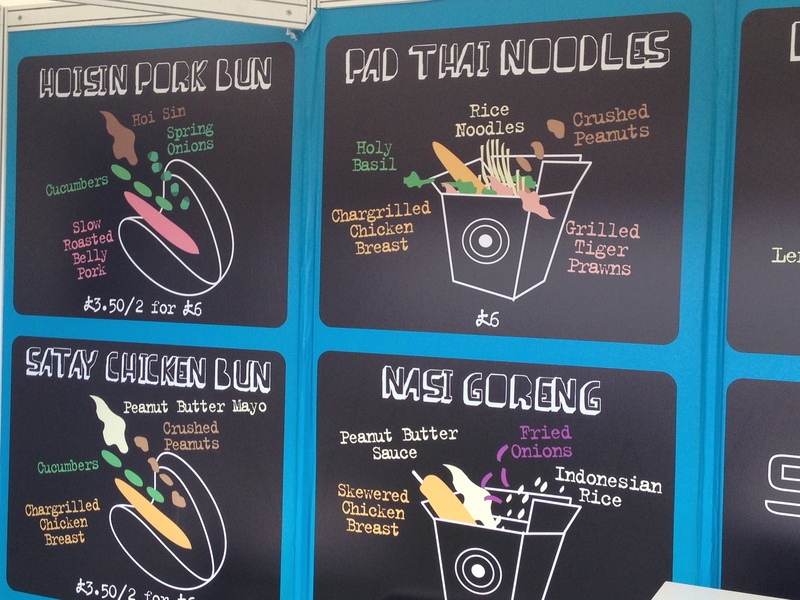 The PTs who were joining us for the day also opted for Pad Thai and not put off by small portions – a rather lovely looking dish from Galvin’s. My Pad Thai was a superb meal but B’s Nasi Goreng was to die for – a creamy peanut sauce with rice, chicken and delectable aromatic spices. It was my first taste of Nasi Goreng and shall not be my last. 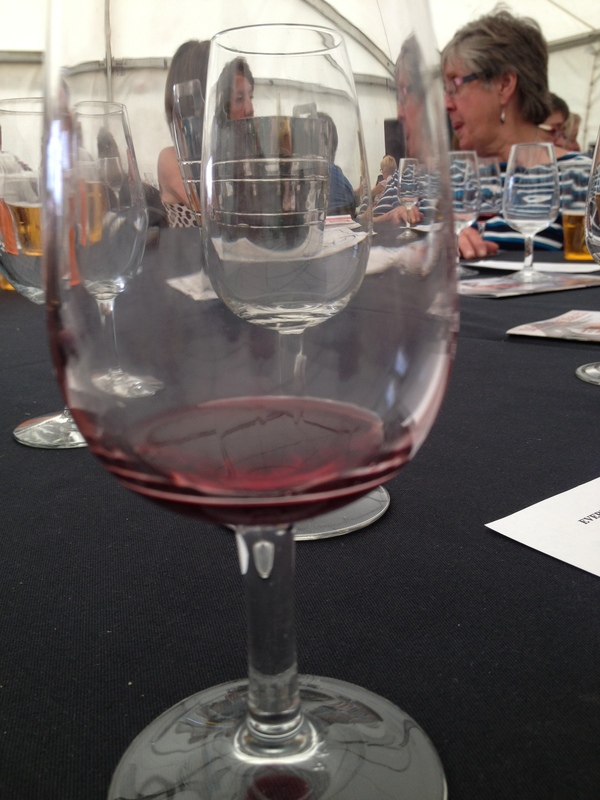 Next up was the Bordeaux tasting which took place in a big old tent. B was kind enough to take the children away for a wander leaving myself and the PTs to get stuck into some wine. Did I learn much? Erm not really. Did I enjoy it? Yes immensely. Despite the amount of vino I actually consume I am not really a wine buff – I like what I like and am not precious about where it hails from or how old it is, however the gentlemen leading the tasting was entertaining and the wine tasted pretty good to me so it was a winning formula all round. Meanwhile back in the melee of the festival we joined B and two hyper children for the stall trawl – one of my favourite parts of any food festival. 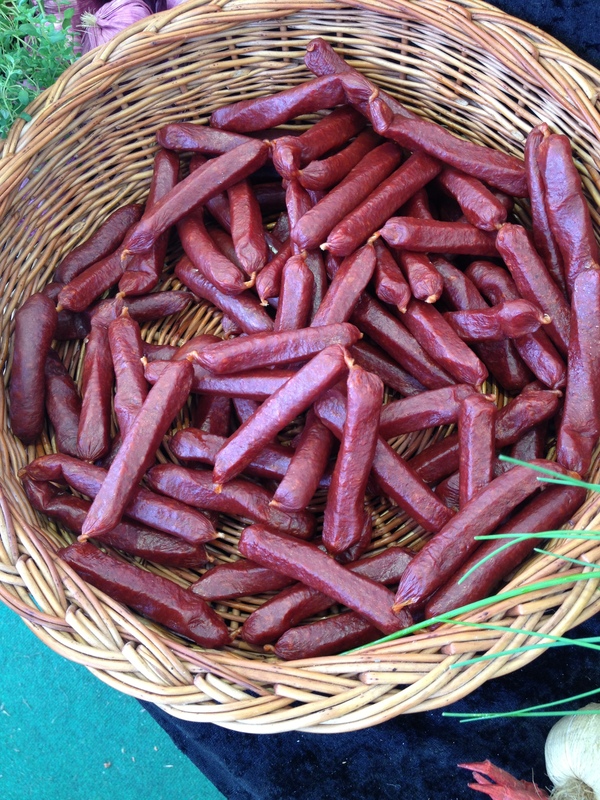 There were some old favourites – we stocked up on German Sausage again as we seem to do at every festival – and some new discoveries. We met a lady who made perfect little frangipani cakes and another who make towering wonders in every hue. There was the curly potato phenomenon which seemed to attract the biggest queue in the festival. On closer inspection it appear to be a huge curly chip on a stick – the mind boggles. The boys dandered off for coffee whilst we escorted our girls to the Pizza Making Masterclass. 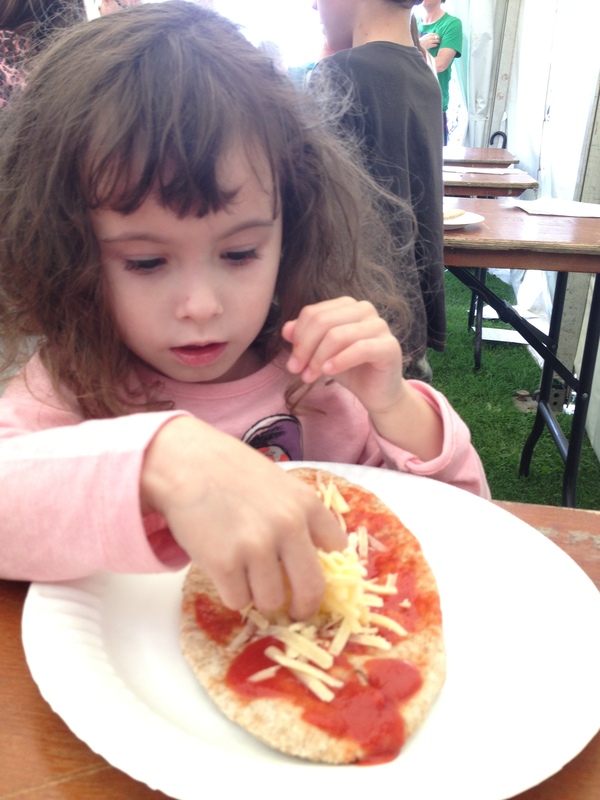 The kids did seem to like this Masterclass, but really we were just stood at a table with pitta breads and a selection of toppings and left to get on with it. The only interaction with the “Masters” was when they took children’s names down when putting their little creations in the oven. Had I shelled out extra cash for this I would have been a bit put out but as it was I was fairly chilled about the lack of … well the lack of anything involved in this particular masterclass. All too soon it was time head home – smiley and all full up after another hugely enjoyable day at Foodies. Till next time ……. It seems a while since I’ve sat down to update the blog. Its been one of these periods where life seems awfully busy without terribly much actually happening. I keep trying to think about what I have been up to over the last couple of weeks; but apart from a meningitis drama which landed my visiting cousin in hospital (thankfully better now and thankfully not down to my fish pie) there is nothing of note. So what to tell you ? 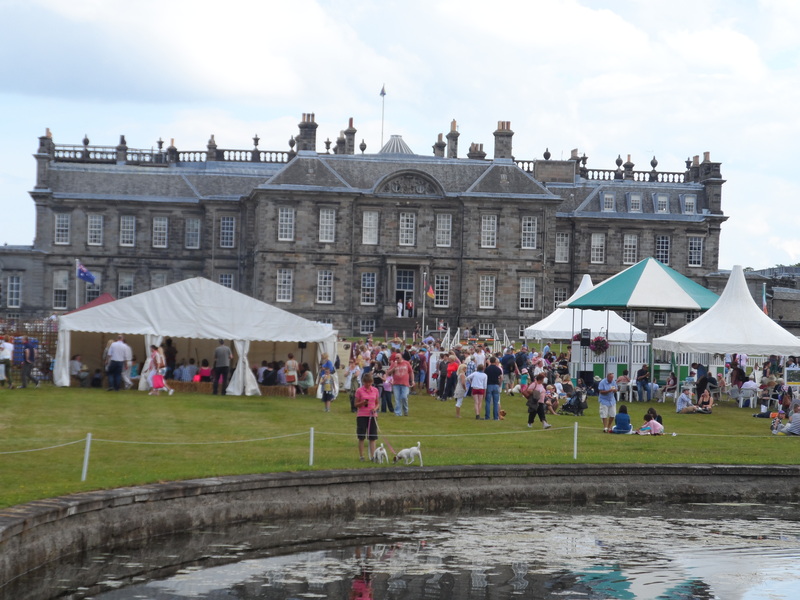 A couple of weeks ago the sun shone long and hard enough to allow the Grumbling three to enjoy a fantastic day out at the Hopetoun House Country Fair (and horse trials). Horses are nice from a distance but I am still traumatized from the day I tried to dismount a horse whilst in full gallop. Hanging from a horse by one stirrup is enough to put one off horses for life BUT country fair was surely double-speak for FOOD. So off we trotted with empty and expectant tummies to the beautiful Hopetoun House estate, which lies just outside South Queensferry. After parking in a big old field looking out over the Firth of Forth we trundled along until we spotted a tractor pulling trailers of fair going folk down to the area where the stands were. Pretending that it was a big old adventure rather than admitting our sheer laziness we hopped on board. We were transported in dingly dell fashion to the beginning of the Country Fair. There we found a small pleasant area with a few coffee stalls a vintage style merry-go-round and a lot of horses in their horse houses. The principal thought running through my head was ‘lovely but is this it?’ followed swiftly by my second thought ‘where is the food?’. Stick with me – it gets better! After a bit of stumble trip stumble trip (prize to the person who gets that reference) through what mini GT refers to as a deep dark wood, we were greeted with this sight! Ah ha that was more like it. Forget everything else – who would not be impressed by the majesty of Hopetoun House and its beautiful fountain. We put our sharpened elbows away ( taken to most food festivals) it was clear that this was one very relaxed affair and I for one was loving it. There was the sound of folk music drifting from the band stand and a modest collection of craft and food stalls to discover. Puddledub from my own stomping ground were in attendance wowing a rather long queue with their hog roast sarnies and Hopetoun House Estate who are very proud of their home reared Aberdeen Angus beef, lamb, poultry, venison and seasonal game from the surrounding Hopetoun Estate had a fantastic BBQ on the go. 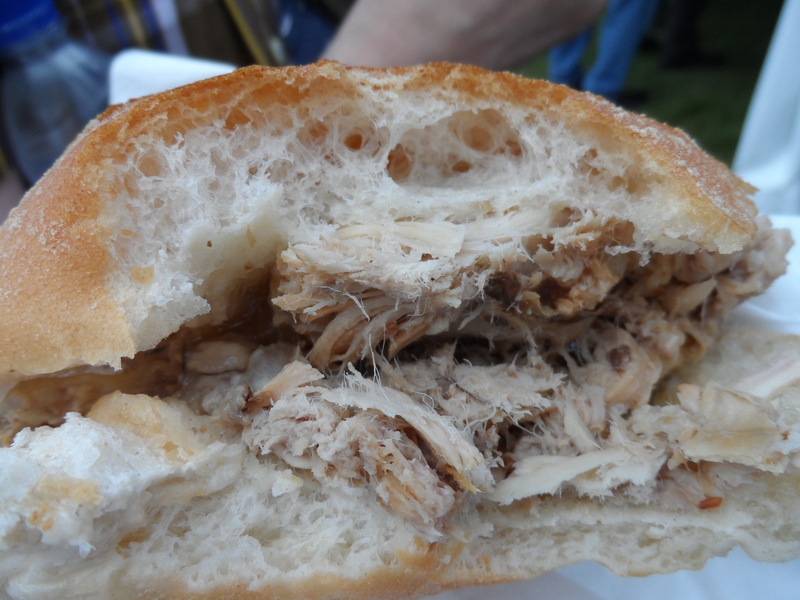 B and I decided on the hog roast – principally due to the fact that the queue was moving faster and I was absolutely starving. I did stand in the Hopetoun House queue eating my hog roast to get some sausages for mini GT as there was an outside chance she may deign to sample sausage (she did not, but we did and very nice they were too). Sitting down in the sunshine, eating beautifully cooked local food, listening to a young singer and playing endless rounds of duck duck goose with the wee one – it was bliss (well the duck goose was a bit tiresome but hey ho!). This could only be improved by some afters! 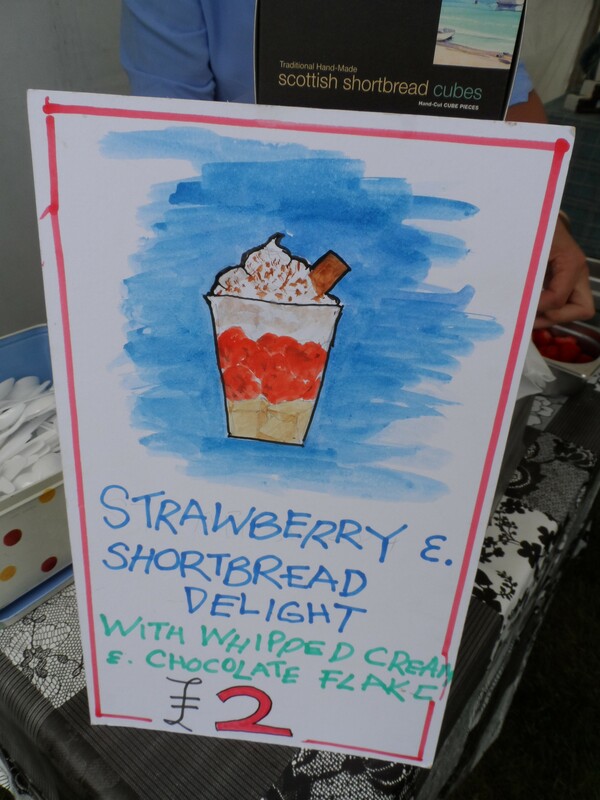 I had spotted some fair-goers carrying what looked like a fresh strawberry and biscuit dessert with oodles of cream and set off to track one down for myself. These lovelies were on the Crystal Shortbread stall and Crystal herself was preparing the delightful puds. 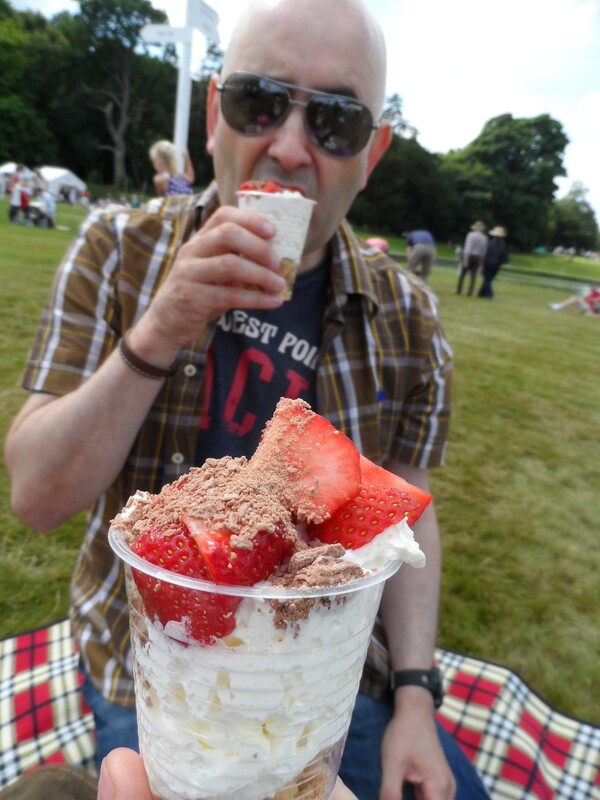 They were simple – crumbled shortbread, lots of cream and strawbs with a bit of chocolate flake crumbled on the top – it said Scottish and summer and I loved it. Mini me appreciated the presence of the best ice cream in Scotland (as far as my husband is concerned) – LUCA of Musselburgh. As well as the small clutch of food stalls there was a fantastic craft tent, rather appealing bar area and a few other brands pitched perfectly to the horsey crowd such as AGA and things made from tweed. I bought a beautiful bracelet from a wonderful lady who upcycles old jewellery to make fantastic creations. There was also a fantastic area for children brimming with toys, games and experiences from yester-year and of course lots of horses galloping and jumping around the perimeter. The only thing missing from this country fair was more in the way of food sampling from local producers. It is what I look forward to most when I go to bigger events but then again these bigger events are not nearly as relaxing and often not as enjoyable as Hopetoun House. I don’t suppose it is possible to have everything and after all the main thrust of this weekend event is the horse trials, which have been going on long before the addition of a country fair. I do hope Hopetoun enjoy success with their rebranding of the event and continue to grow the country fair side – but not too much. The pared down size was part of the charm of this little festival with a very big personality.